The Forerunner 110 is designed to be relatively small and simple, with limited functionality. 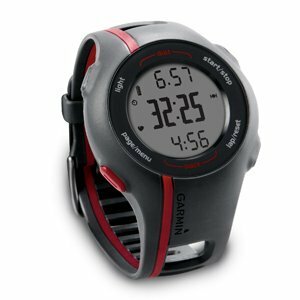 In other words, it is targeting people like me: mostly outdoor runners (it is not very good for biking and useless for indoor running) who don’t need all kinds of functionalities that most other Garmin GPS watches have. It gives you basic information like pace, time, distance, and heart rate (if you are using it with a heart rate monitor), and that’s about it. The relatively small size and reasonably good (=minimalistic) look means that you can wear this gadget on your wrist pretty much every day, without looking like a total nerd. 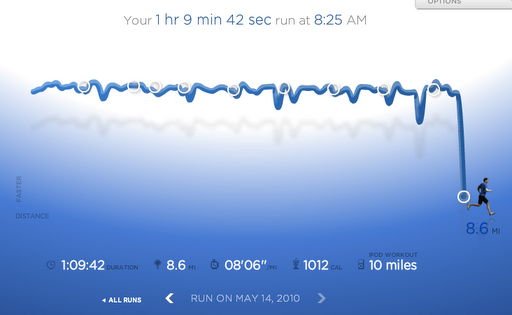 In terms of usability, the Forerunner 110 does pretty well. It doesn’t rely on the touch interface that is built into the latest and greatest Garmin sports watches; instead, it has four large buttons that are easy to push when you want to — or not to push inadvertently when you don’t want to. This can be important in the middle of a sweaty run when you are not really in the mood for the subtleties of dealing with a sensitive touch interface. For example, I often have problems with the touch-wheel of the iPod nano. Recording a run basically comes down to (1) waiting until the watch gets a GPS fix; and (2) pushing the ‘start/stop’ button. In my limited experience, getting a GPS fix works pretty well and relatively fast, although it did take about 5 minutes the first couple of times. That is too much for a runner. Yesterday and today however it was much better, it locked on to the satellites in less than a minute. So far so good. The one major issue I ran into was that, after a first recorded run, when I wanted to upload the data to the Garmin Connect website, I couldn’t get the watch to talk to my MacBook. It took lots of trial-and-error and one-and-a-half hours on the phone with the Garmin help desk to figure out that the charging clip that’s supposed to attach to the four exposed contacts on the back of the watch was not exactly where it should have been, despite the fact that the watch was charging (or it looked like it was charging anyway). This might be just a reflection of my limited intellectual capabilities, but I doubt that I am the only one who will run into this problem. To wrap it up, despite a few – hopefully short-lived – annoyances, I am fairly happy with this new gadget. I will try to find out later how well it can be used for geotagging photographs while hiking or doing field work, something I still don’t have a simple solution for. Update (6/20/2010): I have been using this watch for more than a month now. It works pretty well for running, although I did have a problem today: it froze at one point, and I couldn’t record any new data. It was very hot and humid, and I guess the contacts on the back side of the watch couldn’t handle the amount of salty sweat I was producing. Now it works again. Also, it is a good idea to turn on the GPS reception a few minutes before you start the run because sometimes it still takes 2-3 minutes to get the coordinates. In terms of using it for hiking and geotagging photographs: I did a hike using both this watch and an older Garmin unit, and noticed that the accuracy of theForerunner 110 is better than that of the Garmin eTrex Vista Cx. The watch worked much better in the forest and in a deep, narrow valley, where the GPS signal must have been weak. The problem is that the battery of the Forerunner 110 doesn’t last long enough for a full-day hike; after about 5 hours of constant GPS recording, I couldn’t use it any more. Update (3/30/2012): The problem I mentioned in the update above hasn’t occurred since I did a software update. However, a few months ago (about one and a half years after I bought the watch) the strap broke and I don’t think there is an easy way to replace it. Also, often (but not always) it takes 20-30 minutes to get a GPS lock. It is time to get a new watch, and I think I will stay away from Garmin for now. Hey I just bought the Garmin 110 women's version and the heart rate reading would go in and out. I was running with my husband who has the Garmin 305 do you know anything about not being able to run in close proximity to another heart rate monitor? Also have you run into the 110 going in and out of reading your heart rate? I am wondering if I should bring it back to REI and get a different one. Thanks! Hi, I read on another blog that the pace that is shown on the watch during a run shows an average pace and not the current pace that you are keeping. Can you confirm this?By looking at the graph you have in your post it sure looks like it shows the current pace and not an average. If it was an average I guess the graph would flatten out the further you have run.I'm just getting abit confused over this :)It really would be a deal breaker for me if it doesn't show your actual pace during a run.Oh, and one last question. Does the 110 have alerts to give you a hint if you fall behind a certain pace or to notify you every 1km's with a beep? Anton, what you read on the other blog is correct: the Forerunner 110 does not show your current pace, only the average pace for the current lap. That does not mean that it doesn't record your instantaneous pace, just that you cannot display it during your run.Also, as far as I know, there is no feature that would warn you if you fall below a certain speed. It does give a beep when you completed a lap, with the time and average pace displayed.The lack of these features is not a deal breaker for me, I still find the watch pretty useful, but I haven't been running for very long. Glad you are liking your 110! I bought mine about a months ago and couldn't be happier with it!Like you I was annoyed by the Nike watches and thought that there must be a better alternative on the market so when the 110 came along I jumped at the chance to own one! I bought a Forerunner 110 after my Forerunner 450 strap broke. I thought it would be a cheaper alternative. However, I was very disappointed with the split feature. When you set the auto lap function it gives you the current speed you are running at the split, not the average over the last mile. How needs that? You can look at the watch anytime for the current speed. Lame. I want my 450 back even at twice the price. Mitch, I am not sure I follow what you are saying – I think with the auto-lap function the watch gives you your pace for the current lap – isn't that what you want? Glad to see you left the darkside of the Nike+ set up!In all seriousness though I am very surprised to read the update where you mention the issue with the 110 not coping with sweat.Has this issue occurred again? We review a number of GPS watches and are always looking for as much information on them as possible. If this is an ongoing issue we obviously need update our review with the details. Do you have any more information your can share? That problem (the watch freezing during a run) did not occur since then. I only speculated that it was related to too much sweat — but I don't know, it might have been simply a software crash.I have been using the watch pretty regularly, and at this point my main concern (relatively minor one) is that sometimes it takes fairly long to get a GPS fix. This seems to be related to battery strength — it looks to me like it tends to be a problem when I forget to charge the watch. Our area has a lot of trees and I was wondering if this would have an impact on the GPS functionality of the Garmin 110. Some parts of our training route are covered with trees closing in on each other from both sides of the road. I have no experience with GPS watches. Could you please let me know if this might be a problem before I purchase the watch? I bought the garmin forerunner 110 for my gf and she is thrilled. Its simple and she is going crazy about the color! I am very upset while get tht new 110. It cannot display the current speed while I am running. I used 305 before and got happy for the current speed/pace display on the screen to keep my speed. How can I do that now on the new 110? I hear that 210 has the function to display the current speed. I wonder why Garmin get rid of this useful function in 110. I am try to upload the 210 firmware to 110 to see whether I can change my 110 to 210 with 110 shell.:S. But, unlucky, I cannot find the 210 firmware yet.:(. I want to find somebody has 210 to copy the firmware to me. I cam across the review whilst looking to see if anyone else has had any problems with this watch. I bought mine last October. I had a 410, but found it too fiddly. This was perfect. I mostly run off road on hills and fells in the UK. It told me how far I'd run etc and this was all I wanted. The only bad news at first was that all my estimated distances for runs were too great.After 6 months, it refused to charge. Tried everything, but couldn't get it working. Emailed Garmin and never got a reply. The watch would show it was charging, but it didn't actually work. Very annoying. Went back to the old watch which still works fine. You will see from the webupdater that you aren't supposed to try and update the software without the watch being fully charged. Given that the problem is it won't charge, it's a bit of a catch 22 situation really.Did you get your's sorted out? Hi,May i know how much did you pay for your GF 110 watch? Would you recommend for a runner who just started running? I have the 110 also. I have 2 main complaints. The first you mentioned in your review. I OFTEN have a lot of trouble getting the Garmin and the computer to talk to each other. The connection is very temperamental and the device will often charge but not be able to download data. Very frustrating.The second problem is that there is moisture in the watch. I purchased it less than 2 months ago. The temperature has just taken a dive for winter and this results in the screen fogging up. The watch has been treated with more care than my better half since delivery, as all of my new ‘gadgets’ do. My expectations were higher from this company. I'm a very competive and precise runner, and the one thing I noticed that was WAY off or not accruate was the viewing of the maping. I went on an out and back run just recently and went the exact steps that I went out as I came back. I uploaded my run and the map on the garmin connect showed me going FAR to the left, and not just a little to the left but so far i was off the road… This is not the first time this has happened and I would just like some feedback if this has happened to anyone else before? Is it just the 110 of can i buy a more expensive watch that won't do this?